The Fletcher Arts and Heritage Association and Fletcher Elementary Present Internationally renowned puppeteer Hobey Ford. Mr. Ford is bringing his expertise in puppetry performance and teaching to Fletcher Elementary. Funded through the North Carolina Arts Council as part of the cARTwheels residency grant program, Hobey will be working with both students and teachers for a week of hands-on workshops beginning February 16th (Friday) through 23rd, as well as conducting two performances of his beautiful production ANIMALIA. Hobey is known for his excellence in puppetry performance and craft as well as his skill as a master storyteller. He designs and constructs all of his Golden Rod Puppets as well as the beautiful sets that surround them, and he performs his original works all over the world. He has received the highest awards for his brilliant and priceless contributions to the world of puppetry: two-time winner of puppetry’s highest honor, the UNIMA Citation of Excellence, recipient of three Jim Hensen Foundation grants and The Hermitage Fellowship. 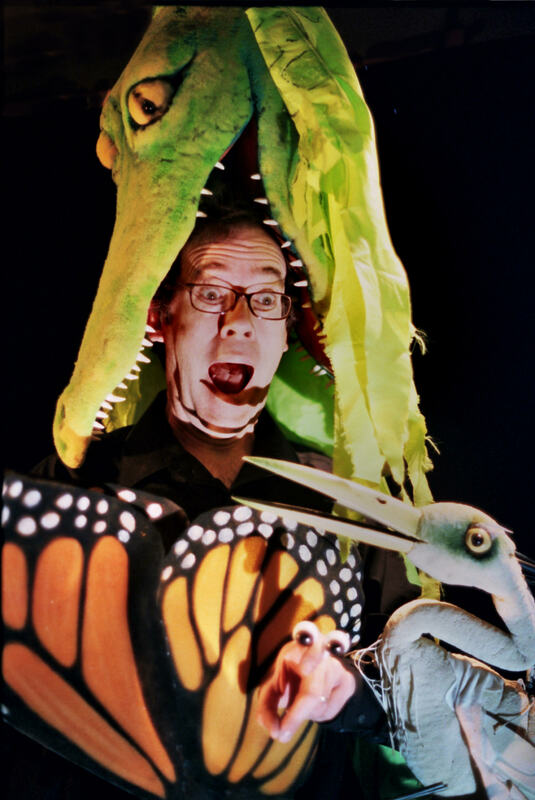 His performance of ANIMALIA explores the magical world of animals through movement, music and visually stunning puppetry. The performance features Mr. Ford’s original “foamies” puppets carved from large blocks of foam with intricate mechanical design that gives each puppet realistic movements. Ford breaks out of the traditional puppet theater booth and turns the whole theater into his performance stage. The pieces include a magnified look at butterfly and frog metamorphosis, the world of birds, his classic undersea ballet of whales, frolicking dolphins and otters.